From “Chic & Simple Sewing” by Christine Haynes, Annie selected and cut the fabrics and did the majority of the sewing on her new sewing machine. I stepped in to help with the finishing. This is a great first dress project since there are no closures. It’s a simple pullover dress. 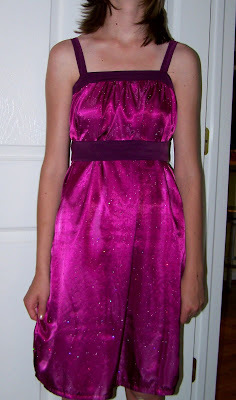 The fabric is a silky polyester with flecks of sparkles, so it was a little challenging to sew. Overall, she is pleased and ready for a night on the town.